Don’t be surprised if it’s an exceptionally emotional day. After all, it’s a Full Moon featuring the Moon in nurturing Cancer and the Sun in pragmatic Capricorn. On the one hand you’re pulled to connect to your sensitive side. On the other, you feel guilty for not working and attending to practical tasks. Find resolution by creating a structure through which to express your emotions while feeling a sense of responsibility for them. Also, it’s a great day to focus in on your home life. This Full Moon may feel especially powerful for those born the end of December, March, June and September. The Sun is at 7 degrees Capricorn, the Moon is in Cancer, Mercury is in Sagittarius, Venus is in Sagittarius and Mars is in Aquarius. 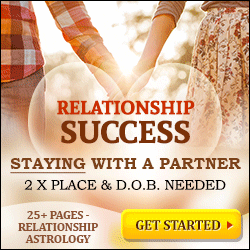 With this combination of planetary energies try to: Date someone from a different country. Diplomacy may be required. Try not to: Deliberately scare loved ones away. You’re braver than that. And finally happy birthday to Denzel Washington, Sienna Miller and John Legend.